Fractal imagery approximates natural processes and structures, while fractal art incorporates the human connection to nature. In neither case, does the final design bridge the gap between reality and viewpoint, but like a poem each resonates with inarticulate meaning and substance. For thousands of years, stone has been used by man in numerous ways, initially for shelter, tools and weapons, then later for ornamental and spiritual purposes. 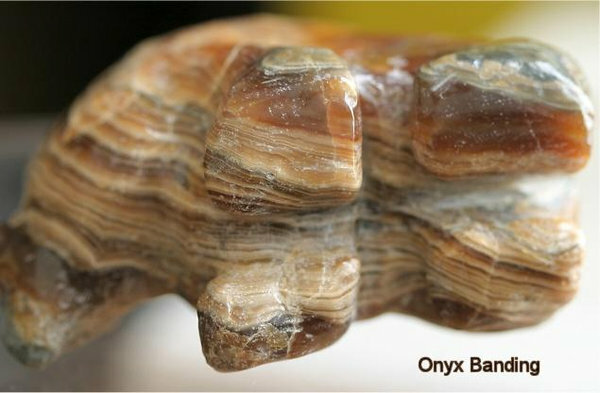 It is the fractal characteristics of stone that are of interest here. By and large precious gems such as diamonds, emeralds and rubies are chosen for their clarity and brilliance rather than any fractal inclusions. Semi-precious gemstones such as agate, lapis and turquoise do have definite fractal appearances, and may be considered “real” fractals insofar as the definition applies. Banding, self-similarity and a fractal dimension greater than three are obvious in their makeup. Take the case of banding, which everyone familiar with the Mandelbrot set is well acquainted with in respect to the outer “escape” zones. But distinct banding in computer-generated fractals is a coloring option that a limited palette produces on the very outer bands surrounding the fractal set. As the number of colors increases to 24 bit or a true color palette, and as you zoom into the fractal, the distinct banding is replaced by velvety zones of connection among the whorls. This according to a purely escape-time coloring scheme. With other coloring schemes devised to take advantage of the extended palette, the banding disappears entirely. Then we are entering into the scope of fractal art, beyond the lowly definition of “fractal.” Compare this to the banding in onyx, which is caused by turbulence in the earth’s crust, fluidic motion of the elements which seeps into the very structure of the inanimate, over a period of thousands or millions of years. Mandelbrot’s loom pales in comparison. 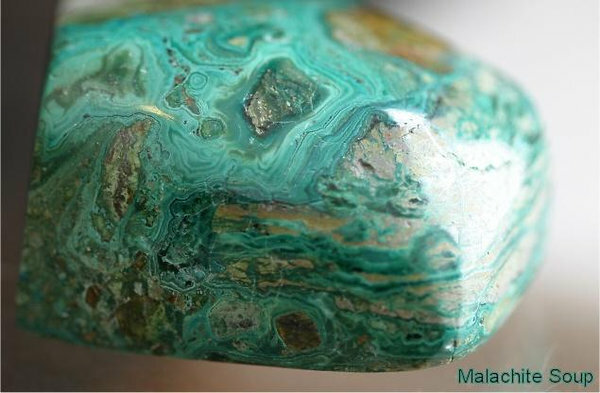 Self-similarity is clearly displayed on the outside of botryoidal stones such as malachite. Cross-cutting shows the internal banding, which can either appear like the rings of a redwood, or as a 2-D Brownian soup, depending on which direction the cut is made. Note that the fractal terms used to describe the characteristics of malachite, cut and uncut are only approximations of the real substance. Artistic applications of stones abound, from wall coverings and fences, domes and arches, to jewelry and statues. 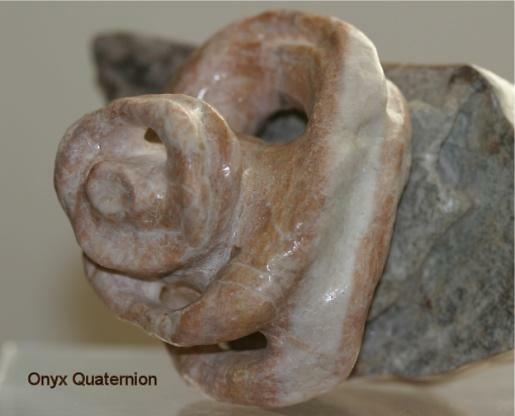 Today’s stone masons and sculptors have an extensive variety of materials to work with from all over the world. With the advent of modern sculpting tools, such as Dremel and Foredom flex tools, almost anyone can learn to carve semi-precious stones. But like fractal art, only a small percentage of crafts persons will approach artistic excellence. Almost all fractal programs can generate a variety of fractals resembling natural phenomenon. Would fractals deserve the same amount of interest if they did not? Euclidean geometry with its straight lines and predictable curves is clearly a man-made notion and the anti-thesis of fractal or non-deterministic geometry. Both geometries have their uses. By the same token, any fractal image can be layered with other fractal images or doctored with exotic filters, and depending on the skill of the artist, a new image incorporating the sense of the artist is created. Fractal programs create fractals; art is created by fractal artists using whatever tools or materials they choose to use (including rocks and paint programs.) No program or set of programs can infuse into an artist’s work what is in the artist’s temperament, unless one is willing to see outside the basic fractal and apply what’s needed to humanize it. The idea that an image of a so-called “pure” fractal can be considered art is akin to judging a sprout a mature tree, or a beach pebble an artifact.